The first page that you see is the login page (figure 1), you have to enter the provided login and password. The session duration is 4 hours. The session time is initialized every time that you change the page. In the left side of all pages you will see the navigation menu, depending of your wight you will see more or less options. Clicking on it you can go to different pages of this solution, see figure 2. This is the main page of StreamLiveCut (figure 3), in this page you can see and navigate trough live or recorded signal, to select the segment that you want and send that segment to a V.O.D. publisher (local or Brighcove). Eventually you could see the following information messages on the top of trimmer page (figure 4). 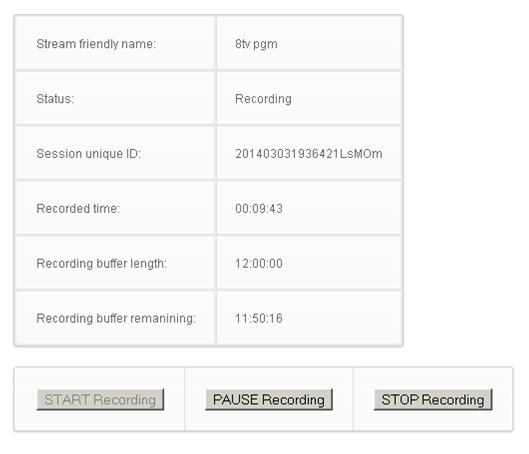 If you see that the “Stream record is STOPPED”, this means that the live signal is not recording at this moment, to start recording go to recording config and press start. Although the recording is stopped you can continue publishing segments of the previous recording. If you see that the “Stream record is Paused this means that the live signal is not recording at this moment, to append new images to previous recording go to recording config and press start. Although the recording is paused you can continue publishing segments of the previous recording. This page lists the trimming jobs that you are doing, and the jobs that you have been done WITH THE CURRENT RECORDING STREAM. 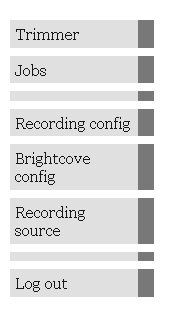 If you stop & restart the recording all previous jobs related with the previous recording streams will be hided. In this page you can follow the trimming process step by step. 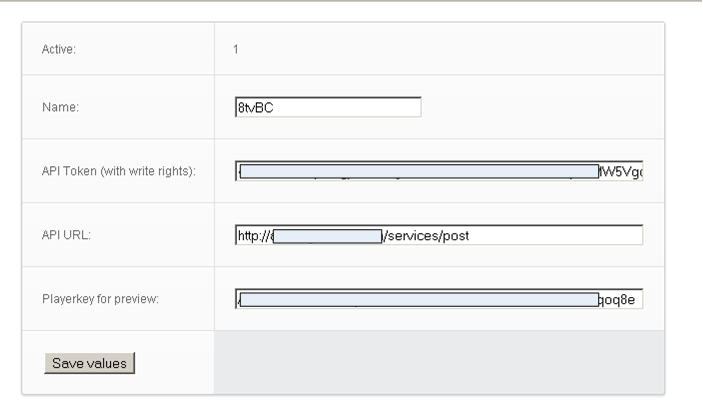 In this page you can set your Brightcove API settings (URL, and token) in order to enable Livecut to publish into your Brightcove account. The player key is only used for preview purposes. It indicates us the player to use when you click in the link of jobslist page. In this page you can start / pause / stop the recording of the configured live stream. If the buffer length is reached the recording stops automatically. It is important to note that if you stop & restart the recording all data of the previous recording is deleted, and all current jobs will fail. Only administrators can see this page. Is where we can configure the parameters of the input stream.